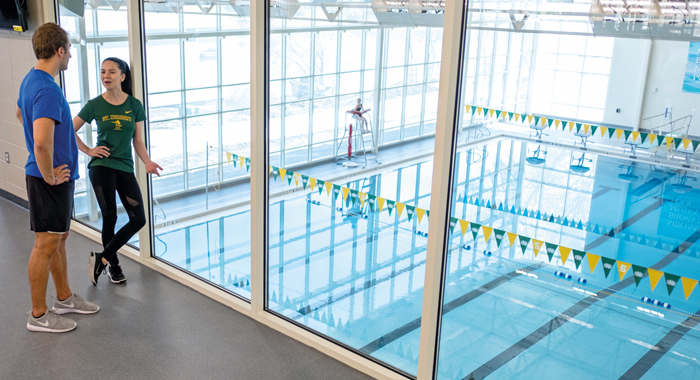 The campus gains its first swimming pool, an expansive fitness center, and a new health and wellness center with the May 12 dedication of the Mulva Family Fitness & Sports Center (MFFSC). The $26-million expansion and renovation of the former sports center – home of Green Knight basketball and volleyball – was completed ahead of schedule, which gave members of the Class of 2017 the chance to enjoy the facility before their graduation. Lead donors Jim and Miriam (Brozyna) Mulva ’69 were able to attend the dedication ceremony. Miriam told the crowd: “A state-of-the-art fitness center is paramount to students when they are unable to work out outside owing to the Wisconsin weather. Stressing the wellness aspect of preventative medicine was also something that Jim and I felt was really important. Working out is a great stress reliever which will help the students cope with situations with more confidence. Playing sports is a great way to make new friends and to feel part of something bigger than yourself, as you accomplish things that could not be done alone. The facility also incorporates an airy and well-equipped fitness center – an amenity, like the pool, for which students have long clamored. Expanded offices for athletics staff will be housed on a new second floor. All of the college’s health- and wellness-related activities, including counseling services, will now also be housed in the new center – a move in keeping with the philosophy of creating a wellness resource for the entire campus community as well as for its student-athletes. The project, designed by Performa and built by Miron Construction, retained but upgraded the current gymnasium space, which is used for basketball and volleyball and also by various Green Knight squads for practice and training. Its arena provides a 116-by-230-foot multipurpose area with a seating capacity of 2,500 for major sporting events and up to 5,000 for other high-attendance programs. The storied space offers a full collegiate basketball court, an indoor track, four volleyball courts and four intramural basketball courts. The former Schuldes Sports Center, which forms the core of the renovation, was dedicated in 1979. It is the only facility in the Midwest Conference to have hosted the league’s men’s and women’s basketball tournaments at the same time during the same season – and this has happened five times: in 2010, 2011, 2014, 2015 and 2016. The center was named for Malcolm Schuldes, who died in 1989 and who contributed nearly $600,000 to the project, and for his late wife, Rose. Water inspired one of two significant artworks by artist David Griggs for the new MFFSC. Griggs created “Dancing Waters” (above), a site-responsive piece inspired by the eternal cosmic Divine Dance (perichoresis) of the Trinity. The mural depicts the dance of love that impels the Holy Spirit to hover over seas and rivers. The Divine Dance is revealed to human hearts at Jesus’ baptism in the Jordan River. Griggs’ second piece, installed in the lobby of MFFSC, is itself titled “Perichoresis,” and explores the divine dance itself. Despite his presidential, building-dedicating suit and tie, nothing could keep President Tom Kunkel from marking the occasion with the first dive into the new pool.